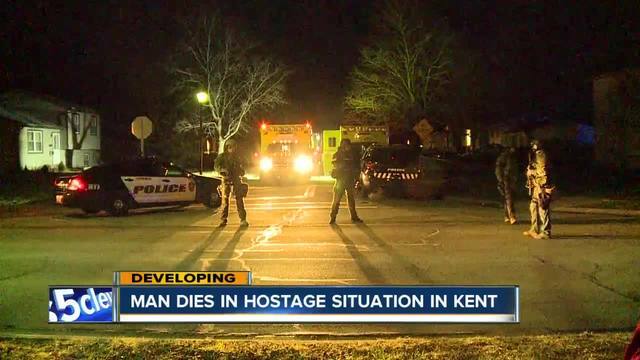 A man was killed in an officer-involved shooting Sunday night during a seven-hour standoff at an apartment complex in Kent, authorities said Monday. Bureau of Criminal Investigation Spokesperson Jill Del Greco said a knife was recovered from the barricaded scene where a man barricaded himself and 23-year-old Amber Weathers on Sunday afternoon for nearly nine hours. The man was identified as Christopher Carter by the Portage County Coroner's Office Monday morning. He died at the scene, police said. Weathers was taken to University Hospitals Portage Medical Center. An investigation leads to the discovery of a warrant out for her from an unrelated incident. She is currently in custody at the Portage County Sheriff's Office. Police were called to Villages at Franklin Crossing about 12:30 p.m. after someone reported possible drug activity occurring a the apartment complex, Kent police Lt. Mike Lewis said. When officers arrived, Carter, 27, of Kent, barricaded himself along with a woman inside a laundry room in one of the apartment buildings. Metro SWAT was called to the scene about 2 p.m.
Nearly 20 people from the complex were evacuated. After several hours of negotiating, police said the situation turned into a rescue operation. Police rescued Weathers at about 9 p.m. and was not harmed, Bureau of Criminal Investigation Spokesperson Jill Del Greco said. One officer was taken to a local hospital to be treated for minor injuries. The Bureau of Criminal Investigation is handling the investigation of the officer-involved shooting. Portage County court records list a bevy of cases for a Christopher Carter dating back to 2005 in the family and criminal court, and ranging from child support to domestic violence, receiving stolen property and drugs. An arrest warrant was issued for Carter in September after he allegedly stole two packs of steaks from an ACME Fresh Market. It is unclear if Carter was arrested for the theft.